Cars always have their VIN numbers. They always have a way of identifying them. If a car is missing a VIN, it raises a whole lot of questions, none of them which don't normally end up in the car getting seized, and someone getting arrested. 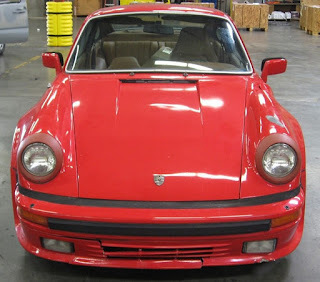 In this case a 1976 Porsche 911 that was stolen in 1988 was recovered. The car was missing the engine, and had a low declared value. Customs opened the container, and inspected the vehicle, finding the car to be stolen. Normally when a car is being exported, the title needs to be cleared with customs. However, if the car was exported without driveline, they might have not declared it as a vehicle, rather as vehicle parts, which is legal. Now, nearly 23 years later, the car has been recovered, found in a container scheduled to be shipped from the Los Angeles/Long Beach Seaport to the Netherlands. The car was discovered by U.S. Customs and Border Protection (CBP) officers after “targeting and examining” the container, a press release from the agency says. The officers ran a check of the VIN in law enforcement databases, and found that the car has been reported stolen on November 24, 1988. Nevada law enforcement confirmed that the stolen record was still active. The 911 was then seized, and released to Nevada officials to be returned to the insurance company that currently holds the title. The 930 is sitting a little high in the back; that’s because it’s missing its 3-liter flat six. Even without that vital piece of hardware, CBP estimates that the car is worth “approximately $27,552.” Apparently, one factor that led the authorities to open the container was the vehicle’s declared value of $12,552, which must have seemed a bit on the low side. Our book says that 930s in number 1 condition – which this one definitely is not – are worth a little over $55,000. The 930 is one of 51 vehicles and 49 engines seized at Long Beach on their way out of the country between October 2010 and August 2011. Of those 100, 24 turned out to be stolen, 63 were undeclared, seven were undervalued and six had fraudulent documents.